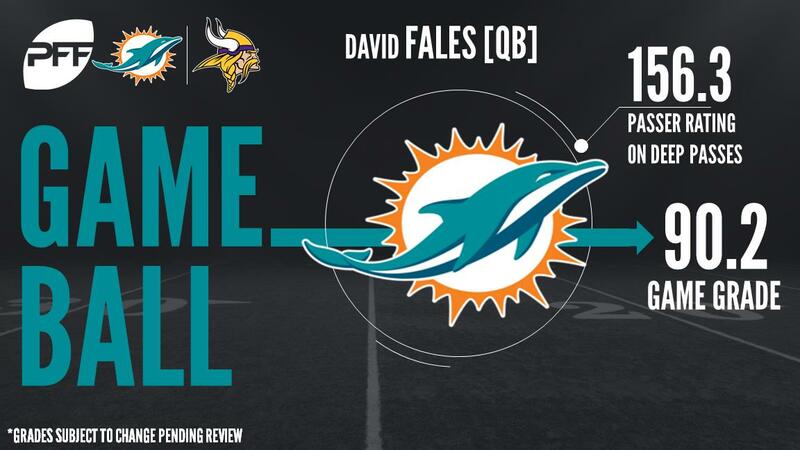 In spot duty as the team’s likely third-stringer for the regular season, Miami Dolphins QB David Fales put up big numbers in the team’s preseason finale, a 30-9 win over the Minnesota Vikings. Fales completed 12 of 20 pass attempts for 193 yards and 3 touchdowns. On the Minnesota side of things, WR Cayleb Jones hauled in 9 of his 10 targets for 127 yards and a score. With that, we give you our PFF exclusive takeaways from the contest for each team. Isidora was very good run blocking on the interior for the Vikings Thursday night. He showed off his strength on double teams, moving Dolphin defensive linemen back to the second level, his efforts earned him a run-blocking grade of 90.0. But the Dolphin interior linemen got the best of him rushing the passer as he allowed one hit and one hurry in 28 snaps in pass protection, which gave him a poor 46.2 pass-protection grade. While Bradley was just a bit above average in run defense (70.5 run dense grade), he was outstanding getting to the quarterback. On 13 pass rushes, Bradley recorded one sack and two hurries earning a pass rush grade of 80.0.